Astronomy Today 4/e (ISBN 0-13-091542-4) is the more comprehensive text by this: proven team of authors. This twenty-eight chapter text begins with the foundations of the history of science and physics as they relate to astronomy (Part One), then proceeds with an "Earth-out" organization for coverage of the solar system (Part Two), stars and stellar evolution (Part Three), and galaxies and cosmology (Part Four). New with the fourth edition, the book is now available in two paperback splits: Astronomy Today 4/e: The Solar System (ISBN 0-13-093560-3) covers Part One on foundations (Chapters 1-$); Part Two on the solar system (Chapters 6-15); the Sun chapter (Chapter 16); and the final chapter on life in the universe (Chapter 28). Astronomy Today 4/e: Stars and Galaxies (ISBN 0-13-093571-9) includes Part One on foundations (Chapters 1-S); Part Three on stars and stellar evolution (Chapters 16-22); and Part Four on galaxies and cosmology (Chapters 23-28). 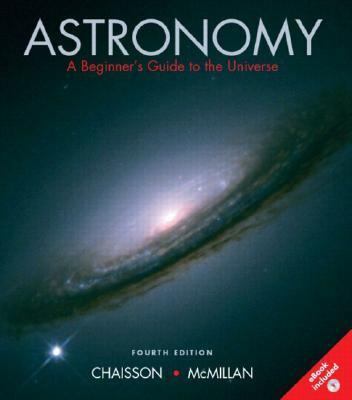 Astronomy: A Beginner's Guide to the Universe 4/e (ISBN 0-13-100727-0) is the authors' briefer text. It covers the same scope of material in the same order as Astronomy Today 4/e, but with less detail and in fewer chapters (eighteen instead of twenty-eight) and fewer pages.Chaisson, Eric is the author of 'Astronomy A Beginner's Guide to the Universe', published 2003 under ISBN 9780131007277 and ISBN 0131007270.